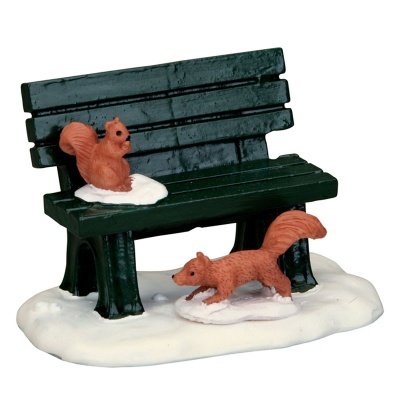 Lemax Park Bench In Winter Accessory depicts a tranquil seat in snow enjoyed by two squirrels as a delightful addition to a scene in a Lemax Winter Village display. A Lemax Vail Village miniature accessory for fixture or placement in amongst a natural Winter scene, as a recent addition to the Lemax collection in 2015. Park Bench In Winter is an individual hand painted polyresin piece mounted on a snowed base to compliment your seasonal Lemax Village display.